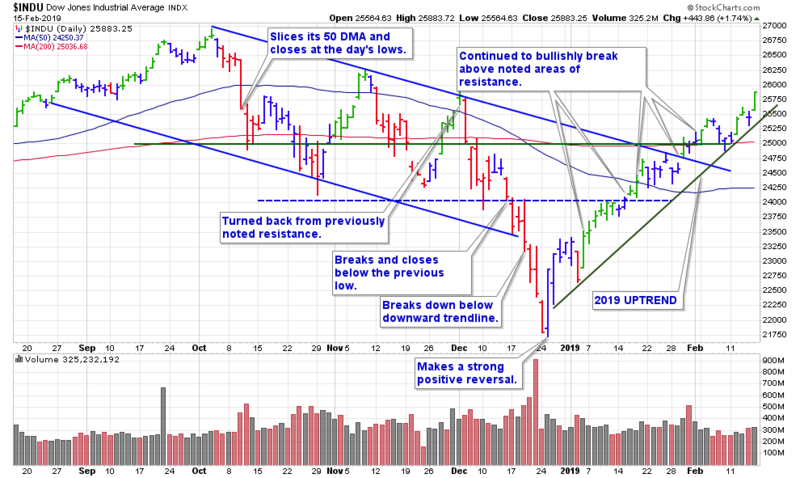 The 2019 uptrend continues with the Dow Jones and Nasdaq now posting eight straight weeks of gains. The Nasdaq gained a solid +2.4% on the week. 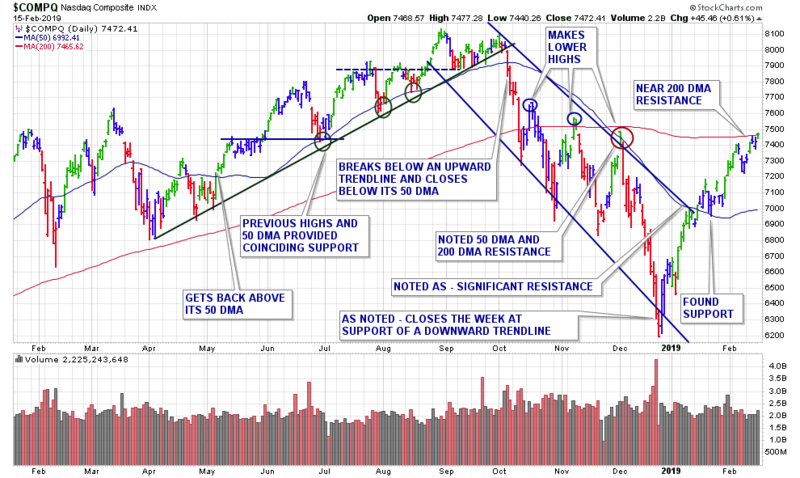 The tech-laden index still has yet to definitively break above its 200-day moving average, as it did close above there Friday, yet by just 10 points. The S&P 500 index added another +2.5% this past week. After being turned back from its 200-day moving average during the previous week, the index cleared that resistance level on Wednesday. We added another distribution day this week. The count still remains low with 1 on the Nasdaq and 2 on the S&P 500. Still, the major averages should be monitored for any continued distribution days. 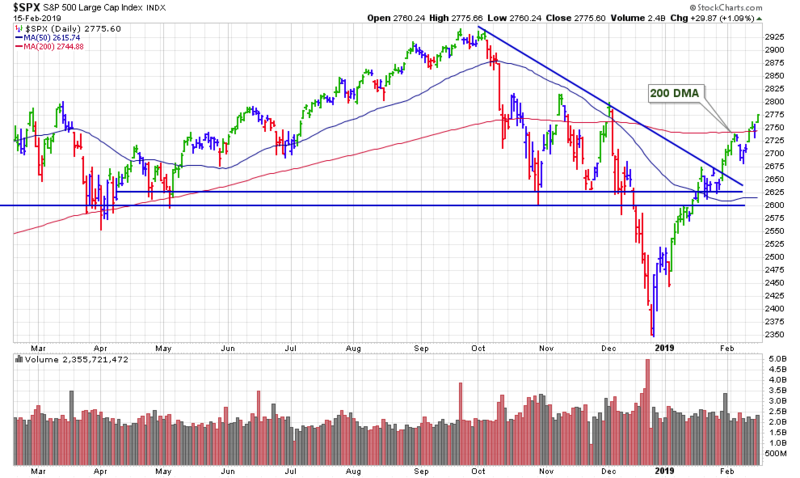 Both stocks and indexes should be watched closely if any near their respective support levels. Regardless of market conditions, I am always preparing a watch list of high-ranked leaders which are building bullish technical bases. This week, I ran my routine stock screens and added 1 new stock to our weekly watch list. I will continue screening throughout the week and post any additions. If anyone is looking for any specific setups, long or short, please let me know. Regardless of market conditions, I am always preparing a watch list of high-ranked leaders which are building bullish technical bases. This week, I ran my routine stock screens, yet did not find any new stocks to add to our weekly watch list. I will continue screening throughout the week and post any additions. If anyone is looking for any specific setups, long or short, please let me know. 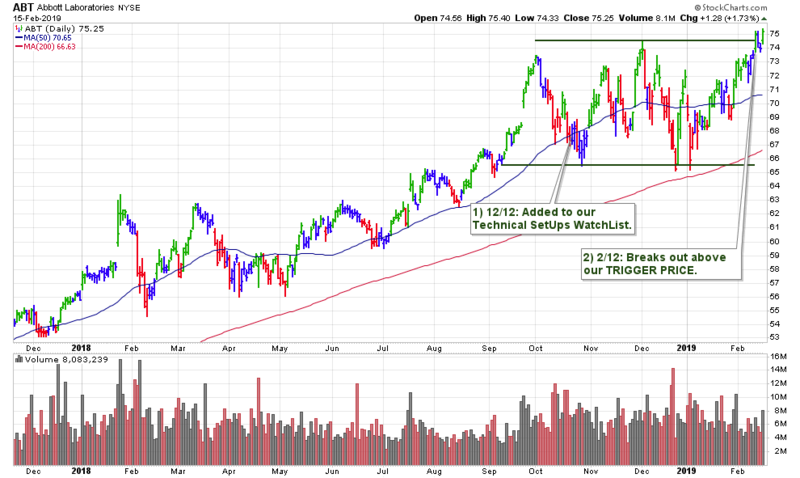 This past week we had 2 breakouts from our weekly watch list. 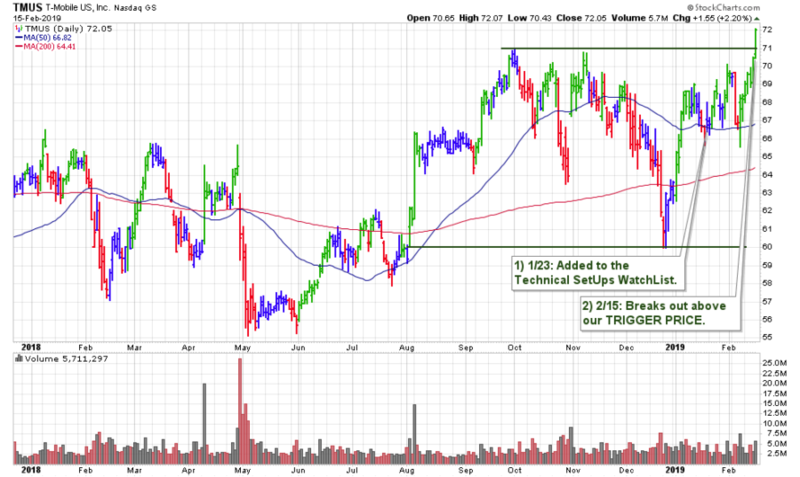 This stock just broke out for us on Friday with a +43% increase in volume. Shares closed the breakout day at the session high, and at a new all-time high. We are going to put our 1st SUPPORT at the round-$70, and our 2nd SUPPORT at the 50-day moving average, which is currently at $66.82. Shares of this selection broke out on Tuesday, however, volume lacked conviction as it was only about average. The stock did trade somewhat lower on both Wednesday and Thursday on lighter volume, so that was disappointing, but not too much of a concern. This action was quickly negated with Friday’s gains of +1.7% with a +13% increase in turnover. Going forward, any above average volume declines would be our first concern as price is more than +6% above the 50-day moving average. Our 1st SUPPORT will be some previous highs and the round-$73. Below there we have our 2nd SUPPORT at the 50-day moving average, currently at $70.65.